Newman wanted it early on the possession. He was uncovered at the 3-point line. Graham didn't see him. Really impressed with Svi's first half. Great D on Bagley, 6 points and 7 rebounds. 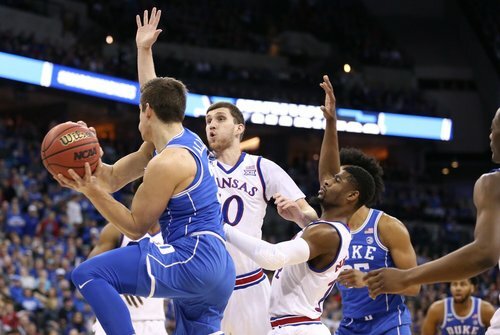 Svi Mykhailiuk has seven rebounds. Timeout KU after Duval's dunk. Graham fell asleep and Duval made #KUbball pay. Duval acted like he was talking to Trent and was going to give him the ball and then just went. Wow. 34-31 Duke. 45.4 seconds to play 1st half. Self calls timeout to set up 2-for-1. Duval explodes for a 1-handed jam after driving by Graham. Raises the roof after. #KUbball down 34-31. Duval leads all scorers with 11. De Sousa scores on a lob. KU successful on the 2 for 1. Silvio on Bagley for the last possession. What a half. Duke up 36-33. Duval is a 28% 3 shooter and 10 pts a game. Shades of Perry Ellis against West Virginia. Silvio De Sousa couldn't slow down enough to make a layup to end the half. #kubball goes into the break down 3. Duke with the 24-16 advantage in points in the paint. KU with the 24-14 lead on the glass. Devils up 36-33 at half. Look at the stats and we are in bizzarro world . . .
Take care of the ball a little more and we will be in front. 20 minutes left! Should be up by one at half. Doke and Silvio both missed easy layups. Shots like that have to fall if we want to have a chance to win. That being said I am surprised we're this close after shooting 4-14 from 3. We need to get to 12 3's to have a chance to win. Duke made 5 of its last 7 shots entering halftime. I feel good about it. We're getting easier baskets than I thought we would. Vick is passing on some of those 12' baseline jumpers. Duke seems a bit confused at times on defense. Stop the turnovers and make the easy shots and we'll win! It's close....but just don't know. Gotta stop shooting ourselves in the foot with turnovers. That's what's hurting us most. I think a good defensive adjustment for Self would be to switch assignments for Newman and Graham. Have Newman take Duval in the 2nd half. Devonte needs to lock down Duval or this will be his last half.